Recent years for Tipton-Rosemark Academy Baseball has been prosperous. 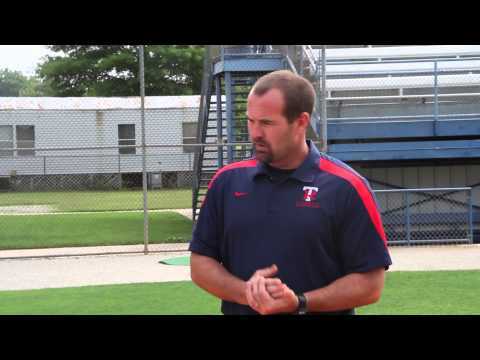 Since 2009 under the watchful eye of Head Coach Brad Smith, the Rebels have played in several Sub-State rounds, visited two State Tournaments with a runner up and witnessed multiple TRA standouts sign scholarships to play college baseball. Entering the 2012-13 school year, Rebel Jacob Johnson wanted to be the next in line. And with a senior campaign going 7-2 and being selected a Shelby County All-Star, Johnson attracted the attention of several area colleges. Johnson saw limited time on the varsity hump in 2012 because of hurlers like JT Moody, Andrew Ralston and current Arkansas State pitcher David Owen. “During the summer I started working really hard,” Johnson recalled. “I got all-tournament in Fort Myers, Fla. And after that I just started working really hard at home. I knew I had to step up and be a leader on the team. And I did that and had a really good season. Johnson’s parents Jackie and Teri were on hand at USA Stadium to watch their son’s dream become reality. The little boy who started playing competitive baseball in the Bartlett area at the age of 10 was signing to play in college. Jackie said he knew since his son was 10 he had the talent to play college baseball. But it took that mental wake-up call in the Sunshine State to help him live up to that potential. “He put in a lot work coming into this year,” he said. “He worked hard and he knew his abilities and what he needed to work on. And he did well. Jacob kept the positive momentum going into his last season for the Rebels. With his arm, bat and glove in the outfield, Johnson helped TRA take one of the top spots in league during the regular season. “He very well could have been 9-0,” Smith noted. “He gave us a chance to win every time he stepped on the mound. He went deep in each game. What at asked him to do was five or six innings. And he did by competing in the zone. He just had a tremendous year for us. Johnson said representing TRA one more time and displaying he belonged on the All-Star stage was memorable. Southwest Head Coach George Sykes said watching Johnson’s All-Star performance validated his scholarship offer. “He comes out a very competitive high school program, and a staff I highly respect in this business and what they do,” he said. “Coach Smith and his staff do an outstanding job. And he’s a great fit for what we’re trying to do because of the basics. Smith said joining Salqui Baseball will give Johnson a chance to carry his talents to another level. Johnson said that is his next goal but for now he’s happy to make his name the latest in this run of TRA Baseball success stories.